It was hard to destroy Ashendel like this. Such a lovely city. If you pay attention you can see the smoke billowing from the buildings, services just hard to catch any minute detail in such a long distance shot. Cities come and go. Heroes live and die. Generations grow and evolve. But war. War never changes. But it does become more efficient. Question: Where is the water coming from in the top panel? I’m assuming the water in the top panel is a waterfall coming from the lake/pond in the bottom panel. What I was trying to figure is where is this water coming from it the city is on top of a land formation shaped like a tree. Perhaps they have a deep well being pump up to the top. It isn’t on top of a land formation shaped like a tree. It’s on top of a tree. The water is probably being fed up through the tree from its root system. That the second biggest tree I seen in all my life. THAT’S NO TREE!!! It’s a SPACE STATION!!! I got that vibe at first, too. I think this is just one of those pages where you have take in the scene fully before getting the right idea. also, the break between this page and the last is a bit sudden. Otherwise the page is spectacular though. Yes, me too. Maybe a tweak to Nastajia’s dialogue could clarify it? Something like “What happened here! ?” in the second panel or something. And I agree the transition is too sudden. I didn’t even get that they were going to go here from the last few pages. No, not just you. I also had to do a double-take after reading Scott’s comments. It might be easier to see the damage in the top panel if it was from a closer viewpoint. It still looks freakin’ awesome. It did take a second glance to see the destruction, but I think its ok. If you pay attention you can see the smoke billowing from the buildings, just hard to catch any minute detail in such a long distance shot. they escaped minecraft and went beserk here to? It’s a shame to destroy something that lovely! I hope Astoria can be rebuilt. I’m still trying to recall when exactly Astoria was under attack. Getting old! I know. I know, it’s bad… I just couldn’t resist! Until I read Scott’s comment, I too missed that the village was under attack. Her statement seemed more like ‘I’m home at last’. Perhaps I’ve missed it, but who/what attacked the city? Also, no one seems to be discussing it in the comments. Nightmare realm…..a revived dragon (since a body wasn’t found)……a new mysterious enemy? As Scott points out above, it happened a while ago. Nicodemus went on a rampage after he got the compass away from them and destroyed all the tablets, laying waste to any place they were being kept. This was before the war. Oh dear. I had forgotten Nic trashed Ashendel to get their tablet. This is sad. I hope the losses were just property and not people. Thank you for your attention, and now back to the story. Nah. A tree dwelling should look like the treehouses on “Codename: Kids Next Door”! Another critical thought…I also didn’t know initially who made the comment ‘my land’ ‘my home’. I can’t even tell if the image is the pirate ship or a person (poor eyesight?). I’m assuming who it is based on the comments left (although, the king could state ‘my land’ only one person in this group could really say ‘my home’). I realized pretty quickly who had to be speaking, and I didn’t find the transition that abrupt, not after remembering they’d made arrangements to meet at Astoria in 2 days. I can see now that Nastajia and Alexander were getting ready to fly back to Ashendel at that moment in yesterday’s strip. 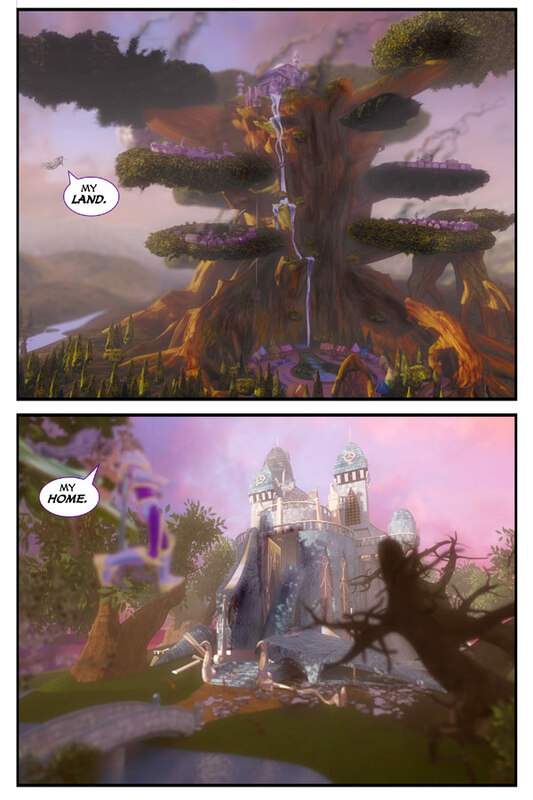 I do think it could be a little clearer if Scott hadn’t blurred Alexander and Nastajia flying in; making them sharper in the first panel would make it easier to realize it was them approaching the great tree. In the second panel, I think I would have put the view point above and behind them, looking over their shoulders at the wreckage of the castle. This would put them at the bottom of the panel with the castle looming up in front of them at an angle as they swoop down from above, with them lit slightly differently to separate them from the back of the scene – the out of focus effect wouldn’t be needed at all, and the extent of damage to the castle could be made clearer. So sad! I hope they can rebuild it. On another note, just saw your pirate ad on Girl Genius and it was beautiful! I remember when Ashendel burned but I agree, this transition seems way too sudden. It’s not sudden to me – I’ve been wondering what would be left ever since we had the tale of Nicodemus attacking it. I expected much destruction, because of how deep into the castle Nicodemus would have had to have gone to get to the tablets. I am actually surprised the damage isn’t worse – but then we’ve only seen the outermost wreckage so far. And we haven’t seen the toll among the elves who tried to defend it. I can only imagine the look on Nastajia’s face; I’m hoping Alexander isn’t just standing there in shock too – this is when she needs him by her side. If Nicodemus were to show up right now, I’d wager she’d start taking him apart with her bare hands! Because they’re waiting for FEMA to respond. If you pay attention you can see the smoke billowing from the buildings, just hard to catch any minute detail in such a long distance shot.